So far my travels in australia have taken me through the outback. In some places to the middle of now-where! I arrived in Darwin in the northan territory of oz to walk out to a shield of heat. The weather in new zealand was nothing compared to this. From the very start i was melting. I arrived and checked into my hostel and waited for morning to arrive so i could go exploring. I didn't see much of Darwin exept for the shops and some organizing. I decided to go on a day trip to Lichfield national park. 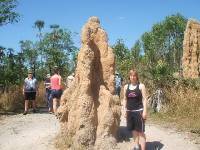 Here i saw termite mounds and lots of wildlife. i even got to swim in a waterfall. That evening i walked round the famous market by the beach. It had lots of music and entertainment and stalls to see. 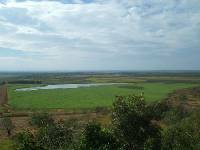 Kakadu National Park was to be the start of my tours of Australia. I met the group that i would sp[end the next couple of days with. We went right out into the bush to see the wildlife and what true australia was about. 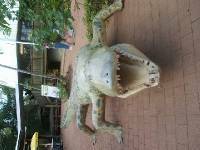 I went on a hjumping crocodile cruise and saw lots of sights. It was also good to meeet people who were doing simular things as myself. That night we camped in perminant tents. It was pretty scary as there was a hughe spider above my bed. Someone said it was either a huntman or a wolf spider. Which ever it was it was very aggressive and did not like the fact we were there. Just thenk i could have been bitten and poisened. Ahhhh! The following day we went to an aborigional cave art sight that was hundreds of years old. Facinating place. The next trip was a three day tour from Darwin to Alice Springs. The guide was brilliant. She told us lots of information and stories about where we were. The stories about the aborigional people and their culture was so detailed. we got to see where they lived and how. A lot of this trip was diving so we entertained ourselveson the bus. The first day we went to Kathrine Gorge where i chose to take a cruise along the water. the scenery was beautiful. On the way we found a couple of great swimming spots in naturally heated thermal pools. The camps were tents and an open fire. Many a ghost story was told. Unfortunately driving at night can be pretty dangerous. A cow darted out infront of the bus and there was nothing we could do but hit it. Its very sad but in the end it didn't survive. Apparently this is very common in the outback. There was some damage to the bus but nothing major. The following day we went to see the devils marbles. These are giant rocks formed in unuusual boulder like pattens in the middle of nowehere. The aborigionals see them as a sacred sight and have special ceromonies there. Before reaching Alice Springs we stopped at the oldest pub in the northan territory. It was so unusual. people from all over the world had left things there. it was full of cloths, pictures and shoes of travellers. There were also sighs with funny slogans on. some of course were not repeatable. When we arrived in Alice we had some time before going out for the last time as a group. At 5.10am i stood half awake waiting to catch the bus for the next section of my oz trip. It turns out that this one would be the highlight of australia. Carl was the very enthusiastic driver that would be with the group for the next 6 days, and what a group it was. 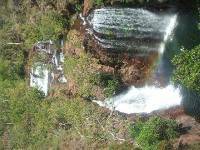 I was travelling with a couple of people that werre with me in Kakadu and met lots more. there was 20 passangers in total and a great bunch of people. The diver got everyone interacting quickly and mixing together. The first destination was Kings Canyon. What a fantastic place. We did a 2 1/2 hour hike up to the top where we could see the whole canyon and then walk round it. The view was amazing from the top. Even thought eh heat was almost unbearable it was one of the highlights. That night we went to the campsite next to Uluru (ayres rock to most). It was so special as i got to sleep in a swag under the stars. A sway is an aussie giant sleepingbag/tent. you get inside with your sleeping bag and sleep looking at the stars all night. The only problem is as it was winter it was very cold at night. Another early start marked the next morning but i don't think anyone could complain as we got up and drove to uluru to watch sunrise by the big rock. What a view!!!!! There was lots of people, tours and independent travellers all stood round watching and waiting for the sun to come up. the atmosphere was quite exciting. people mingled together and we got to catch up with friends from other groups. When it was officially day light we started the 9.4km walk around the base of uluru. The rock had so many different personalities. It was constantly changing after every corner. When we reached the cave part, Carl met us and told us about the aborigional dream stories. It was so amazing. there were sacred men and women caves and parts of the rock where we wern't allowed to go. I fell in love with the history of it all. I would like to know more. In the afternoon we hiked the valley of the winds where the olgars are. 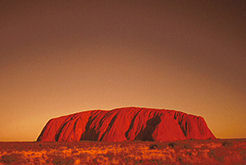 this is another place where there are large rock formations in the outback of oz. After a break we went back to Uluru to watch sunset. this was another magical time as we stood drinking champagne as we watched the sun go down. This time we fouind a secluded spot for just our group to see away from the crowds of people. In the morning we packed up really early as we had a long drive to coober pedy. 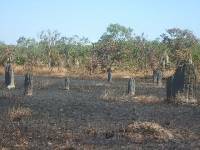 This is were the most extreem heat occurs in australia so most of the people live under ground. They say it provider a constant temperature away from the heat in the day and the cold at night. It is also the mining capital of oz. We actually got to have a tour round one of the opal mines and learnt about how it is done. I really enjoyed this. That evening we all went out for pizza and to an underground bar in a hotel. Such a fun place. 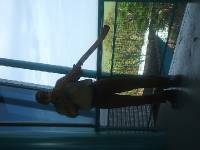 The next day we went to a rocket launching place called Woomera at Port Augusta. For our final night we stayed at a place called Parachilna. It had a tiotal population of 8 residents. Such a funny little town. We had a huige common room where we played some strange games during the evening. We also enjoyed a bbq where we tried kangaroo, camel and emu for dinner. i found it a bit difficult to get my head round it all but i tried eberything. A great achievement for me. The final day we headed from Adaleide we checked out some aborigional rock art on the way. the stories that they tell are the way the used to communicate with the next gereration. there was no written launguage. this is how the stoories were not lost. In the evening we arrived in the city of Adaleide. By this time it was cold and raining but nothing could dampen our spirits.